The under display fingerprint technology of this cellphone is very much impressive but still I can’t that features as a justification of charging more than the value of this phone. I am very obsessed with the features of VIVO V11 PRO and according to me this can be the most top rated cellphone of this year. I just came to know that VIVO is a sister company of OPPO and performance of VIVO is same similar to OPPO’s cellphone. I am not very satisfied with the shape of VIVO V11 PRO whereas the features of this cellphone is quite remarkable. Price of this cellphone is also very high not in the range of middle class people. Battery timing of VIVO V11 PRO is very much amazing and the display graphics of this cellphone is also very much inspiring. In display finger print technology of this cellphone is quite fascinating and amazing and I would suggest people to once try this cellphone personally. Under display touch sensor to unlock the cellphone is very much innovative idea by VIVO and I highly appreciate VIVO for this innovation. In built finger print technology of this cellphone is very much innovative as well as very much effective. I really admire Vivo for bringing these types of innovation. VIVO V11 pro has an amazing internal storage capacity with amazing display size and graphics. Camera quality is also outstanding. With Rs.47, 000 investment a great piece of technology but not much happening with design. Can be mistaken for any other phone than a VIVO V11 PRO. For someone not with a meticulous nature this can be mistaken for a Samsung note 9. The size is the same and even the feel looks almost identical, the guts of this phone is it's plus point. I am very obsessed with V11 looks and its under display fingerprint technology is very fascinating as well as very impressive and innovative. I couldn’t find any flaw in this cellphone. Amazing cellphone with top quality features in very reasonable price. One can easily justify its price after looking at its attributes. Amazing cell phone with very innovative concept under display fingerprint. In display finger print technology of VIVO V11 Pro is very impressive and the looks of this cell phone is also very fascinating. Simply a perfect phone within this range. I must admire Vivo for providing that much of features within this price range. VIVO is an emerging brand having very reasonable models and can be a threat to its competitors in future. I suggest everyone to once try their products. I am shocked to see VIVO V11 PRO providing 25 MP on front camera. I must declare it a more selfie phone than anything else. I am highly interested in buying this cell phone now. This cell phone by VIVO is one of the most top quality cell phone I have ever seen in my life. I must suggest people to go for this cell phone as every single rupee do worth its dashing looks and features. 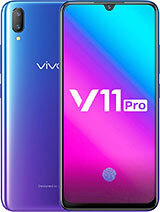 Read 62 User reviews and comments on Vivo V11 Pro - Reviews about mobile price, performance, processor details, RAM, ROM, Display battery timing, network support other Vivo V11 Pro detail.